Washington’s Branton Dawes stands atop the podium in first place at the Nelsonville-York tournament Saturday, Jan. 5, 2019. He was also named the Most Outstanding Wrestler of the tournament. 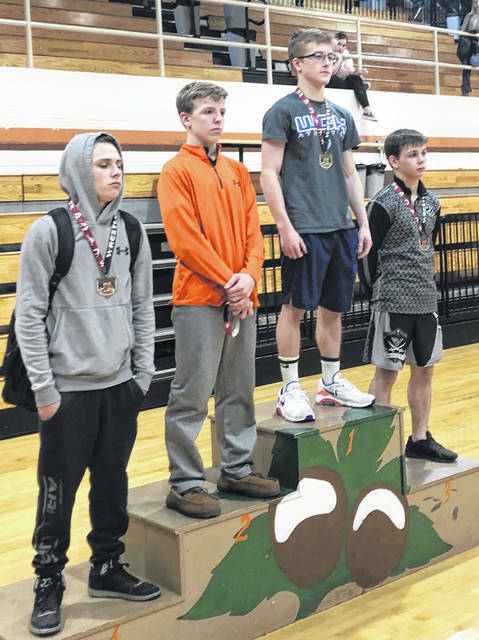 Washington’s Mason Mustain (second from left), stands in second place on the podium at Nelsonville-York following the tournament there Saturday, Jan. 5, 2019. Members of the Washington Blue Lion wrestling team stand outside the gymnasium at Nelsonville-York High School after they placed 11th out of 23 teams at the tournament there Saturday, Jan. 5, 2019. The Washington Blue Lion wrestling team competed at Nelsonville-York on Saturday, Jan. 5. The tournament consisted of 23 teams from all over the state of Ohio. It featured wrestlers ranked in the top 10 in the state, returning state place-winners, and state qualiers, along with many other tough wrestlers. The Blue Lion wrestling team was up to the challenge of the tournament coming away with an 11th-place finish out of 23 teams despite not filling all weight classes due to injuries and sickness. Leading the way for the Blue Lions were a pair of freshmen; Branton Dawes (113) and Mason Mustain (220). Dawes defeated returning two-time State placer Collin Yinger from the the host team Nelsonville in an exciting double overtime match where Dawes managed to wow the crowd with a last-second takedown. The coaches also voted Dawes the Most Outstanding Wrestler of the tournament. Mason Mustain came up just short of a title despite dominating the competition all day long. Mustain lost an exciting triple overtime match to returning State placer Hunter Braithwaite from West Jefferson. Other Blue Lion wrestlers who placed in the top eight at this difficult tournament were; Chase Sluder, 5th; Collin George, 7th; and Austin Chamberlain and Dylan Moore, both in 8th place. The Blue Lions will wrestling at Miami Trace for the final time in the Panther Pit Thursday at 6 p.m.
https://www.recordherald.com/wp-content/uploads/sites/27/2019/01/web1_Branton-Dawes-nelsonville-Jan-5-2019.jpgWashington’s Branton Dawes stands atop the podium in first place at the Nelsonville-York tournament Saturday, Jan. 5, 2019. He was also named the Most Outstanding Wrestler of the tournament. 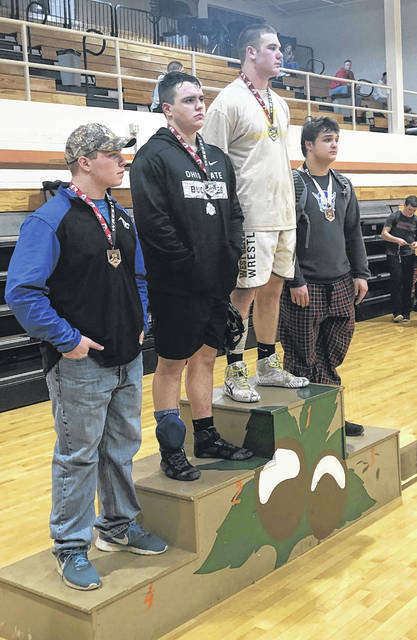 https://www.recordherald.com/wp-content/uploads/sites/27/2019/01/web1_mason-mustain-nelsonville-Jan-5-2019.jpgWashington’s Mason Mustain (second from left), stands in second place on the podium at Nelsonville-York following the tournament there Saturday, Jan. 5, 2019.